The motel rooms at the Colonial House are in attached wings off the main building. Each room has private bath, cable TV, free WI-FI and outside entrance. There are two comfortable chairs in each room, a writing desk and dresser and sufficient space for a rollaway if there is an extra person in the party. The rooms are all furnished in a comfortable country motif, offering an alternative to the cookie cutter style of a national chain. In addition, the porches which overlook the Green Mountains have Adirondack or lawn chairs for those pleasant Vermont afternoons. We try our best to make your stay comfortable and pleasant. Our summers are mostly mild with cooler nights. However, we have a few hot days and we provide fans for your use. Both the guest living room and the dining room have air conditioning, but not the individual rooms. Please tell us if this is a concern for you. We want the Colonial House Inn to be your favorite stop when traveling to Vermont. In order to make your stay as pleasant and stress-free as possible, Inn rooms 4 and 6 have air conditioning, along with Motel Rooms 8 and 9. We also have a portable a/c that can be added to other motel rooms upon request. We have a refrigerator and freezer available for your use in our downstairs storage/sewing room. We also have a microwave available for you to use anytime. If we are not serving a meal in the dining room, you may use one of the empty tables for your family. The meadow around the inn is big enough for children to learn how to cross country ski, snowshoe or rolling in the snow. We often make ski tracks which loop around the outside of the property for a great outing for those 4 and under (OK, for those over 4, too). We accept pets in our motel rooms for an additional $15 per night ($30 minimum). Bring the whole family and make it a real vacation! For our guests, we have a DVD player and many movies for you to enjoy in our guest living room. Or bring your portable DVD player and hook it up to the TV in your room. Motel rooms 1 and 2 connect by an inside door for easy access by families. Also, the deluxe motel rooms 8 and 9 also connect. We provide cookies with coffee or tea in the afternoon in the sun room (lemonade or hot cider depending on the season).We appreciate all our visitors who come back year after year. Send us a card to let us know what you liked or didn't like! Our address is on the top of all our web pages and please tell your friends about the Colonial House Inn! The Large Rooms are on the front side of the long wing, again attached to the dining room. 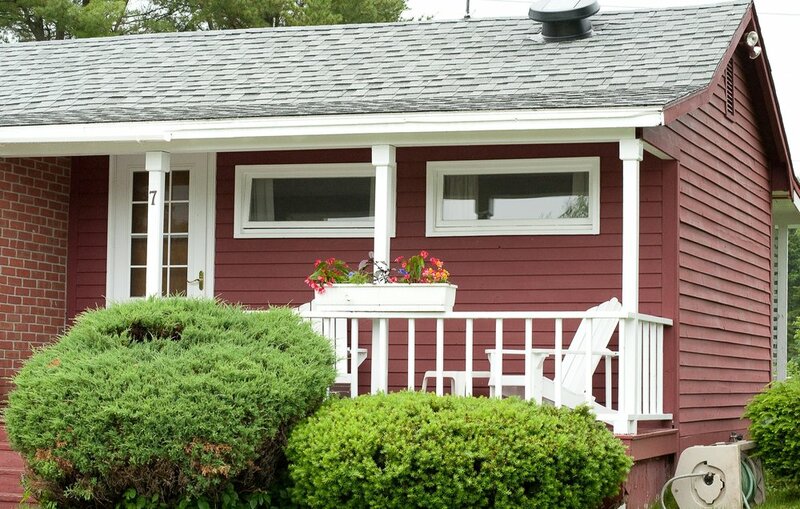 Each has an individual porch with views towards Cobble Hill and Stratton Mountain with chairs for your enjoyment. Two of the rooms, Motel 3 & 5 have two double beds, Motel rooms 1 & 7 have a single bed and a double bed in each room. For large parties, two couples traveling together or families who would like their children in a separate, but nearby room, Motel 1 has a connecting door between it and Motel 2, a small room. The Small Rooms are located on the back of the long wing with two twins in each. A long portico leads to the dining room with a pair of lawn chairs outside each door. These are old-fashioned rooms, pine paneled and reminiscent of mid-century motel rooms. The picture windows look towards Markham Mountain, a spectacular display of color in the fall. The Deluxe Rooms are in a short wing behind the dining room with a pleasant view of our flower beds and the Greens to the west, Markham Mountain and more flower beds are in front of the long veranda. Each room has a queen bed as well as a single bed. The connecting door between the two rooms can be opened to make it convenient for large parties, families or couples traveling together. The Inn Rooms at the Colonial House are upstairs in the farmhouse section above the guest living room. 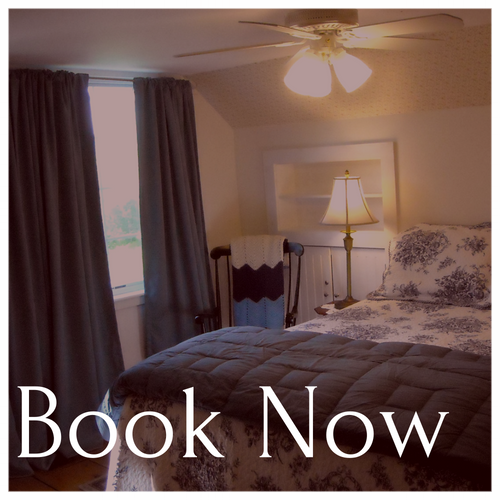 Two rooms in the original Cape Cod farmhouse, Inn rooms 1 & 2 with two single beds in each, were renovated in 2010 to become one room, Inn 1. Located at the end of the hall in a section that dates back to 1790 - 1810, Inn 1 is a lovely oasis with a wide pine plank floors, a queen bed, rocker and love seat. The other guest rooms are in a newer section with rooms 3 & 5, each with two singles and rooms 4 & 6, each with a queen bed. All rooms share two baths in the hall with sinks in 3, 4, 5 & 6. Furnishings in each room are neat and homey with a dresser and chair and windows overlooking the Green Mountains and our lovely gardens.